You can find a remote computer's serial number on the "Processor and Motherboard" node in the "Hardware" tree. See the "System" section, the "Serial Number" item. Also, you can find a laptop model here, at the "Model" item (desktops usually display a motherboard's model here). 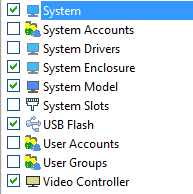 Usually, only branded PC and laptops contain the asset tag information in their BIOS and Windows (HP, Dell, etc.) The DIY computers made by enthusiasts or by unknown vendors do not contain this data. Warning! In order to read asset tags successfully, please do not forget to select corresponding data groups when configuring the computer data collection. The following options should be selected: "System model ", "System", "System enclosure". If the data is not displayed, this can mean two things: 1) the necessary information is missing in the computer BIOS or registry, 2) the data was not polled because the options were not selected (see the below screenshot).